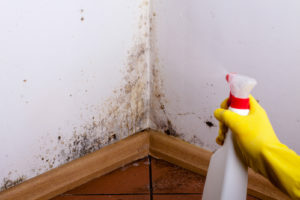 In case you recently had some water damage in home or office, there are great chances that it will leave some inconvenient and unpleasant consequences, such as black mold. Before talking about mold removal in Laguna Niguel area, let’s see what black mold actually looks like and then what is the best way to get rid of mold. Cleaning black mold from various surfaces is no easy undertaking, but it is a feasible one, especially if you are familiar with this much-hated type of mold, and capable of detecting mold, notorious for hiding in plain sight. Black mold appears in black, gray or dark green color and it is usually located in the corner of the wall in dark and wet places. Another sign of black mold presence is a musty and dank smell. However, black mold doesn’t look the same on every surface, and that’s why it’s important to learn how to distinguish it. What does black mold look like on drywall? Drywall can be made from stone or wood which makes it the best place for black mold to grow. If you don’t get rid of it quickly, the black mold will expand fast thanks to cellulose in the drywall construction. The easiest way to recognize the black mold on drywall is to look in its corner and notice if there are some black patches. In early stages, it appears as black dots in irregular patterns, but later it can spread rapidly to other surfaces of the wall. So if you are wondering about the best way to get rid of mold, it’s important to act fast. What does black mold look like on concrete? Concrete isn’t a suitable ground for black mold growth, but if it’s in bad shape, it’s possible to get infected. The concrete wall contaminated with black mold looks like it has mucus, black or greenish patterns grouped in colonies. The black mold will spread quickly if the wall has more moisture as it happens when the house is flooded or when there is a water leak. What does the black mold look like on glass? Glass objects are transparent, so it’s easy to spot the black mold when it shows up. Also, the glass is non-porous material, meaning that it can be clean without difficulty and in that way easily get rid of black mold. The best way to keep your windows, vases and glass containers safe is to regularly check if some dark spores will appear on its surface. What does the black mold look like on wood? It’s quite difficult to spot black mold on the wood because wood has its own specific patches and patterns, so it’s usually hard to make the difference. However, the trick in recognizing black mold on the wooden surface is to search for the color that is a darker shade than the color of the actual wood. It usually shows up on one side, top or bottom, before it evolves and becomes larger. The best way to get rid of mold is to let professionals do it for you. Fifteen years of experience is a guarantee that EHS is the best choice when it comes to mold removal in Laguna Niguel and other Orange County neighborhoods. Call us today before the black mold causes even bigger damage!